The cupcake crochet stich is such a cute and loveable stitch which can be used to create delightful afghans and baby blankets. This crochet stitch’s design is just about the so popular cupcakes. The thought of having a whole aghan made of cupcakes is extremely adorable and sweet. This video tutorial, courtesy of Margaret Olander, features the beautiful Cupcake Afghan by Roseanna E. Beck, and will teach you how to make this simple stitch. The pattern and the tutorial are suitable for beginners. Thanks to Roseanna Beck for the article inspiration and featured image. 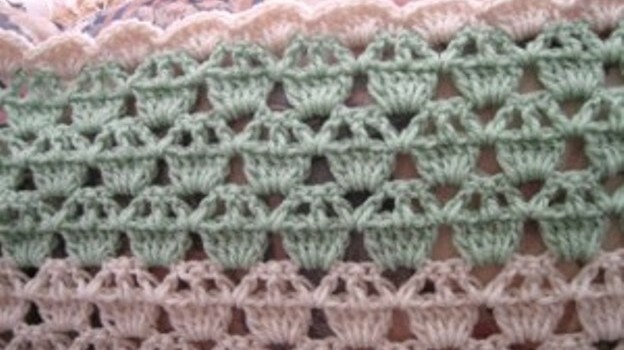 This is a very pretty pattern, used for a verigaged baby blanket. Came out great!! I will have to try this.reminds me of “kittens on a fence post” pattern. Is this pattern hard to do? It’s very cute. I’m have trouble trying to get the patterns I see. I just get a lot of advertising stuff. Liz, I found a stitch for you! Oh how cute!! I can’t wait to try this!! I have used this pattern to make baby blankets for friends who were expecting. It was a lot of fun and easy to do. Tammy Andrews Wolfe omg omg!!!!!! I can see this being used for a baby blanket! So cool thanks for sharing. OMG. It looks like cuppycakes!!! Awesome….sweets without the calories…love it! Cute! I’ll have to try that! That really does look like cupcakes! Neat!! Thanks for the referral although I cringe when I look back at this tutorial! I think it may have been my very first one and it’s horribly done BUT the stitch is so darn cute! How adorable !!!!!! What next ? I’ve tried this one I need to work on it some more lol the one I had was a poorly written pattern! Adding this to my collection!! Thanks for all the cute stitches!! OMG, Donna Marie!!!!!! That is SOOOO cute!!!!! I HAVE to learn this one!!!! Pam Rasch Wheelock it does look nice. BTW would you write down the pattern for the wave one you just finished so we can add it to our library of patterns for other people to use? If not, I understand. I would like the pattern for the cupcake pattern. I want to make a baby blanket. Hi Sharon, pleae click the name of the pattern: Cupcake Afghan to get to the pattern’s page. Hope it helps! I wonder how easy it would be to have the bottom of the cupcake one color and the “frosting” in white. Anyone tried that? Beth Durham-Christopher have you tried this stitch yet? I really like the cupcake pattern. It looks really nice. I’ve gotta try get the pattern and try it. Thank you! I found when working this it doesn’t actually look like cupcakes. I modified it and it looked much better. Instead if dc, ch, dc, ch, dc, I worked 5 dc tog and it was more full and liked more like a cupcake. I have made a couple of these. Quick and easy. This is a new stitch for me to learn. That’s is cute. Must do this my 11 yr old will love it. Although it’s not done this is what I have done. Dulcie Belleville – very cute! Melissa Moses Thompson this is such a cute stitch! Mary Youngblood, this would be interesting to learn and super cute! Cassi Stutsman have you tried it? Is it hard to do? I have not. It is super cute! Mikayla Lloyd Nancy Holman. I love this! Kathy Stevenson Wetherell this might be fun for you! I love it! Can’t wait to try it in some funky colors! I’ve even done this stich! Easy & awesome looking! I’m not that good either! Oh thank you! I’ll try that stitch! Someone commented try 5 DC tog! I want to try it now! Thank you for that tip! Marie Gaudet Bliven. How cute is this? I made a scarf with the pattern before. Very cute and super easy. Have to try this one, so cute! You have a pic of the one you did? My experience with crocheting is granny squares. I like the cupcake squares. I love this. I’m just getting back to my hooks after 20 years. My son said it looked like a face. Then I showed him my altered version and he guessed it was a muffin. So that was much closer. Dottie Odonnell isn’t this adorable? Give me a little bit to find the sample piece I did. Ok. Sorry it took so long. I actually had to make another sample. Here it is. I haven’t worked out the details on the edges yet. They aren’t turning or quote right but the pattern actually looks more like a cupcake. Cutest baby blankie stitch EVER! I’m making right now, I’m using beige for the cake part and different pretty colours for the frosting tops, it’s turning out so pretty. Thanks for ball of your post. What a great idea!!! This turned out so well! Thanks for sharing the idea. Do I need to learn this stitch, in honor of your Purple Tulip Bakery, Merissa Ludwig Green? My grandma would have loved this. I like it, would be cute in a child’s sweater. Regina Bates Sambrano, Janet Jorgensen Patrick…quick, easy, pretty! Jessica Wilkes Isobel Abdelmalek. Love this ! Working on this, coming out really pretty. Cannot wait to give it to my grandaughter. She loves cupcakes. Made a blanket and it was delicious. Quite easy once you know how. I’m currently using baby blanket yarn; thinking of switching up to worsted weight acrylic, and using the above-mentioned tutorial. The stitches over the ‘cupcakes’ look a bit different from the one I’m doing. I’m currently using baby blanket yarn; thinking of switching up to worsted weight acrylic, and using the above-mentioned tutorial. Michelle Heard Isobel Abdelmalek Robyn Wait. 2 of my favourite things together…. cupcake stitch or aka alien skull face stitch. I need to learn how to make a folder, or whatever it’s called, to store all this crocheting information! This stitch is nice! I need to try that one!!!! Okay Lauri, I need to make cupcakes today, haha! Marissa Steindorfer schau wie süß!!! Paulette, please the click the name of the pattern to get to the pattern’s page ( usually followed by the name of the designer) OR at the end of eachh article you’ll find a paragraph saying: “Check out the original source for The Cupcake Stitch (Afghan Pattern Included) pattern with all the directions and full written pattern at: ……. (LINK)….” Click that link. Hope it helps!